Welcome to Prairie Story Recipe Swap Thursday! Happy Summer! The most popular recipe from Recipe Swap Thursday last week was Key Lime Cupcakes @ The Country Cook (again) & Cakewalker! Perfectly refreshing for summer. This week I'm sharing my Smores Snack Mix. Easy, kids love it, and not as messy as traditional campfire smores! Alison, thanks for hosting the party. The snack mix sounds fun! I love all things s'mores. What a fun trail mix! Now I have to laugh - thank you again for your great recipes and for hosting the linky party. Although I can't take credit for Cakewalker's excellent recipe, I'm so happy that his cupckaes were so popular and that he shared them on my blog. Thank you Alison!! 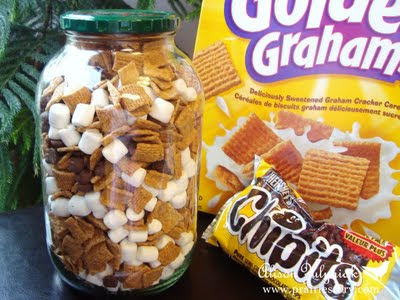 S'mores Snack Mix, What a great idea!